TOKYO • The economic revitalisation plan of Prime Minister Shinzo Abe rested on a committed central bank jolting Japan out of decades of decline. But Abenomics seems to have reached an impasse following the failure of the Bank of Japan (BoJ) to generate a sustained upswing in the markets despite the radical steps of cutting interest rates to negative territory, The Wall Street Journal has reported. 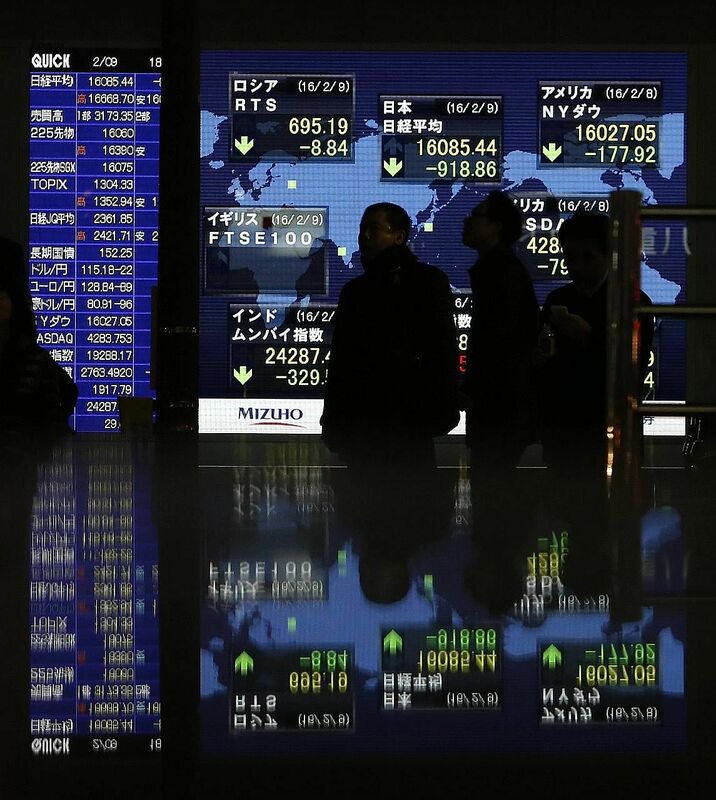 With the economy stumbling, Tokyo shares fell 2.3 per cent on Wednesday, erasing nearly all the gains since the BoJ ratcheted up its easing programme in October 2014. Markets were closed yesterday. The yen was trading near its highest level in more than a year - highlighting a flight to safety that was exactly the opposite of what the central bank intended, but as befits Japan's position as the world's largest creditor nation. The US dollar sliced down through 111.36 yen to reach depths not plumbed since October 2014 at 110.99. The euro also weakened against its Japanese peer, sliding to a 21/2-year low of 126.06 yen. Efforts by BoJ offer lessons to other major economies which lean too heavily on their central banks to take on more risks. "Abenomics has to go back to its foundation point," said Dai-ichi Life Research Institute chief economist Hideo Kumano. "You can't stop the markets from worsening, so the question now is, 'What's second best?'" Since coming to power in 2012, Mr Abe had pledged to jump-start a stagnating economy and get prices and wages rising again. His three-pronged strategy included monetary easing, more government spending and structural growth, of which only the first could offer hope of quick results. Government spending did not last under pressure from the Ministry of Finance, while structural changes like bringing more women into the workforce needed time to take shape. BoJ governor Haruhiko Kuroda flooded the economy with cash, pushed down the yen and helped trigger a boom in corporate profits, WSJ said. But Mr Kuroda could not get companies to raise wages or invest in new technology despite registering profits. Neither could he get Japanese consumers to spend more, although the cheap yen led many Asian visitors to Japan. His goal to reach 2 per cent inflation has been pushed back as the level remains around zero. Mr Abe, meanwhile, gave the green light for a sales-tax increase in April 2014, to lend support to fast-rising pension and health costs, but it chilled consumer spending and sent a message of belt-tightening. A slowdown in China's growth, concerns about European banks and an oil price collapse in recent weeks that has destabilised the global economy, have rocked the Japanese boat. Fighting to keep the momentum, Mr Kuroda on Jan 29 tried a last-ditch step of placing a negative interest rate on some deposits the BoJ accepts from commercial banks - in essence, charging them for parking their money at the central bank rather than paying them interest. Both Mr Abe and Mr Kuroda say their plans have not gone fundamentally off-track. Mr Kuroda said this month the economy "has continued to recover moderately", while acknowledging that a virtuous cycle of profits and wage growth was "somewhat weak". He said there was no risk of a return to deflation and Japan will still be able to reach the 2 per cent inflation target once energy prices stabilise. Mr Abe told Parliament on Wednesday that it was not the end of Abenomics. With his support ratings back at 50 per cent and above, the weak growth does not seem to be affecting his political standing. Corporate leaders also are shrugging off market troubles. Under Mr Abe, "I think there's a lot to praise in the way the economy has got on a growth track", said beer maker Sapporo Holdings president Tsutomu Kamijo. SoftBank Group Corp chief executive Masayoshi Son said he expected the negative interest rates would eventually boost the economy. "It's actually a good thing for SoftBank," he said. The market movements, he added "won't have a direct effect on our results". If Abenomics fails, it is likely to be a gentle failure that puts Japan back into its pre-Abe stasis, not an abrupt crash. The government's huge debt, at more than 200 per cent of gross domestic product, seems less of a pressing problem with the fall in interest rates. Japan can now borrow at little or no cost - or even get paid by investors for doing so.